Upgrading your WordPress site doesn’t have to be expensive. 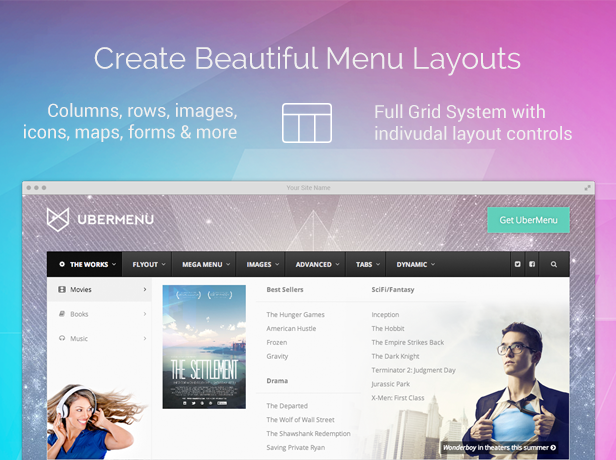 The #1 mega-menu plugin for WordPress. Create menu layouts with columns, rows, forms – even icons and maps! Mobile-responsive and super customizable, this one is a great addition to any WordPress site. The video above shows all the features of this plugin. Visual Composer is already a top-seller in WordPress plugins – in fact, many of our most popular plugins come with it. The Ultimate Add-Ons for Visual Composer has features like animation, countdown timers, timelines, Google Maps, Google Trends, Fancy Text, and more. Social sharing buttons are an important component to any website (just ask our social media manager for tips). This plugin doesn’t just come with sharing buttons – it also includes follower counts, analytics, affiliate & point integration, and A/B split tests. Can’t decide whether you should add a Twitter feed or an Instagram feed? What about your Facebook? Should you add in Flickr, Vimeo, Tumblr, YouTube? If you’re a multi-platform social media user, combine them all with this cool plugin. “This amazing plugin just saved me countless hours of tedious work,” wrote one user. Worth adding to your WooCommerce site. Featured on our list of the best comparison tables for WordPress, this plugin is a favorite for CSS-savvy WordPress users. Responsive, fast, and 100% WordPress compatible. Solve the problem of creating video galleries with this plugin. There’s also built-in analytics that keep track of video views. Need to add a section of logos to your site? For sponsor pages, galleries clients, or more, you’re bound to find use for this plugin on your site. Add a Google Map and a location listing to your site in just a few minutes. Ideal for store locators, office addresses, or data visualization – it even creates searchable, sortable lists in the map. Showcase your team – of coworkers, collaborators, writers, or favorite people – with this customizable plugin. It’s even sortable and has social media integration! Check out more WordPress plugins in our plugin library. Featured image background from Envato Elements.